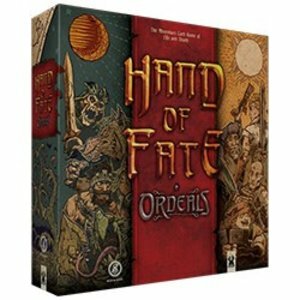 The deck-building adventure board game based on the critically acclaimed Hand of Fate videogame. Each turn, players travel across the map, spending food, fighting minions, revealing encounters and acquiring new skills and equipment in hopes to become powerful enough to defeat the three tiers of Royals; the Jack, Queen, and King. The road to fame and glory is a perilous one but often rewarding as every battle fought, equipment and skills acquired all contribute to player’s overall fame. Player who ultimately defeats the King Royal ends the game, but it is the player who has gained the most fame is deemed the victor in Hand of Fate: Ordeals.